If you have ever needed a third hand when trying to join corner joints together, you know how cumbersome it can be. The 90 Degree Spring Clamps solve this problem by holding the corners of your stock on place. Simply place set the corner of your stock pieces together as needed, then slide the 90 Degree Spring Clamp over the corner with the steel spring clips facing the outside of the box or frame. Repeat this process on the remaining three corners. Secure your stock with whatever method you choose with the 90 Degree Spring Clamps. 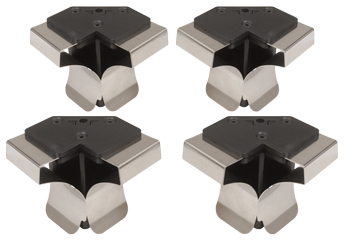 This pack includes four 90 Degree Spring Clamps. Note: designed for stock 1/4" to 3/4" Max.